Anti-austerity campaigners in southern Ireland say Cork City Council’s refusal to accept a petition opposing the Irish government’s controversial water charges is undemocratic and an insult to local citizens. Anti-austerity campaigners in the Republic of Ireland say Cork City Council’s refusal to accept a petition opposing the Irish government’s water charges is undemocratic and an insult to local citizens. The petition was handed over by 50 anti-water charges campaigners who had gathered outside Cork City Hall before a local council meeting on Monday. The petition called upon local councils to stand firmly against the water charges and actively encourage local citizens to resist paying them. It contained the signatures of 15,000 local people who strongly oppose the Irish government’s water taxation policy. The recently implemented water charges form part of the Irish government’s wider debt re-payment plan in the wake of a crippling bank bailout that cost Irish taxpayers over €64 billion. Campaigners maintain they are an austerity tax, and will impact on society’s most vulnerable. In a climate of widespread poverty, negative equity and mounting repossession orders, Irish protesters continue to campaign against the government’s recently implemented water charges.Protesters gathered outside Cork City Hall on Monday had hoped to give their petition to Cork’s Lord Mayor Mary Shields or Deputy Lord Mayor Ken O’Flynn. However, they were informed beforehand that neither Shields nor O’Flynn would be available to meet with them. It is believed Shields was out of office on business, but O’Flynn was attending Monday’s local council meeting. Activists said O’Flynn’s refusal to accept the petition was an offense to public office and “a gross insult” to the people of Cork. Speaking to Irish news site The Journal, they said the petition should have been accepted irrespective of the Deputy Lord Mayor’s political views. Leading anti-water charges campaigner, Diarmaid Ó Cadhla, rejected O’Flynn’s argument. Ó Cadhla, who attended the demonstration in Cork on Monday, said campaigners in possession of the petition just wanted an official representative to acknowledge their presence. “We just wanted someone to come down the stairs, even if all they said was ‘I’m here from the council’ and took the petition,” he said. Referencing the Deputy Mayor, Ó Cadhla noted O’Flynn was chairing the meeting but did not accept the petition. Ó Cadhla said that while this outcome was expected, the anti-water charges campaigners were hopeful that a council member would be able to convince a representative to accept the document. “The petition had 15,000 signatures – that’s 10 percent of Cork city and if you exclude children, it’s more like 20 or 30 percent,” he added. National pressure group Right2Water, which has campaigned against the government's water charges in recent months, argues the provision of adequately treated water and sanitation is a vital public service and human right recognized by the United Nations (UN). 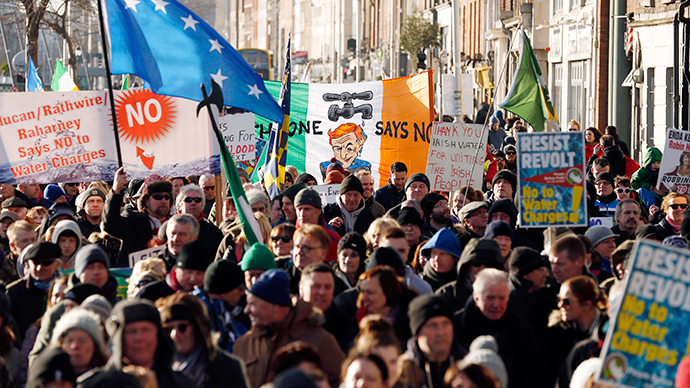 It is calling on the Irish government to legislate accordingly and abolish the water charges.